Watching Family Guy’s parody of Return of the Jedi (which I said a little bit about in this LiveJournal post) made me think about the name Endor, home of the Ewoks. Well, actually, Endor is a gas giant, and the Ewoks live on a forested moon of that planet. Anyway, while I can’t identify any obvious references in the names of most of the planets in the Star Wars galaxy except for Naboo, Endor has kind of a long history, going back to the Bible. Well, probably actually before the Bible, but it’s through this book that the existence of the village of Endor is known. It was a Canaanite city, located in the Jezreel Valley. The story told in 1 Samuel 28 informs us that King Saul, seeking advice on an upcoming battle, decides he wants to talk with his recently deceased spiritual adviser Samuel. Yes, Samuel dies in the first book of Samuel, which means it’s rather inappropriate that there’s a second book bearing his name, but that’s another story. Anyway, the king travels to Endor in disguise to consult with “a woman who divineth by a ghost,” who summons the spirit of Samuel. The dead prophet tells Saul that he’s going to lose not just the battle but his life, which indeed happens, as the king commits suicide after receiving a severe wound. Getting back to the woman, though, she’s colloquially referred to in English as “the Witch of Endor.” There’s actually a Chick Tract using this story in a condemnation of witchcraft, but I really don’t see how that fits. It’s true that the Jews frowned upon witchcraft and sorcery, and Saul himself is said to have outlawed magic in his kingdom, which is why he had to travel anonymously to a Canaanite town to consult the witch. The woman’s magic presumably works, although it’s certainly possible that she’s just pulling a trick on a man who hadn’t eaten at all the previous day or night, and hence might be susceptible to hallucinations. The Greek Septuagint apparently refers to her as using ventriloquism, suggesting that the Greek translators thought there was trickery involved. Some Christian interpretations have it that the spirit of Samuel was brought there by God, and the witch was surprised that her magic trick worked at all. Others say that the ghost was actually a demon, fitting in with the common fundamentalist belief (held by Chick, among many others) that magic is real, but always evil. Mind you, in the actual Bible, it seems like it’s perfectly okay to do magic if it’s in the service of God. Just ask Elijah, Elisha, Ezekiel, or Jesus and his disciples. It kind of seems like Yahweh just didn’t want the competition. Nonetheless, I don’t see anything in the Bible as specifically condemning the Witch of Endor, who’s nice enough to give Saul food when she learns he hadn’t eaten in a long time. If I had to identify a point to the story, I’d say it’s an indication of how desperate Saul has become, that he feels the need to consult a magic-worker when he’d just recently condemned their profession. So what does a Canaanite witch have to do with Ewoks? Nothing, as far as I know, but I have to suspect George Lucas, or whoever named the planet, had the Biblical name in mind at the time. 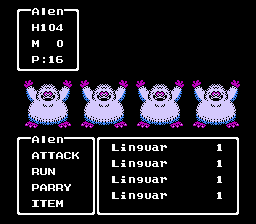 Also, in Dragon Quest IV, the main kingdom in the game world is called Endor. It doesn’t have any witches or Ewoks, as far as I know, but there IS a sloth that creates illusions of itself living there, or at least visiting to compete in the tournament. 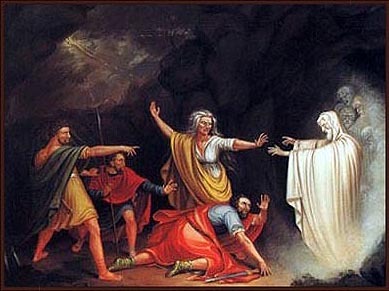 SAUL: I’m going to consult the Witch of Endor. JONATHAN: What’s wrong with the Witch of OUTDOOR? This entry was posted in Christianity, Dragon Quest, Fundamentalism, History, Judaism, Middle East, Religion, Video Games and tagged 1 samuel, abominable showman, bible, endor, ewoks, family guy, j.r.r. tolkien, linguar, middle-earth, return of the jedi, samuel, saul, septuagint, star wars, witch of endor. Bookmark the permalink.